2016 delivered Carter Sampson and 2017 did likewise for Caroline Spence. Odds are quickly shortening that 2018 is the year that Letitia VanSant blossoms out of leftfield indie Americana to become a firm favourite on the back of a superlative album release. GUT IT TO THE STUDS has already sealed the triple mantle of memorable album title, cutting lyric and high plateau track, all that is left is enticing more folks to allow this record drape over them. The journey is destined to be a lengthy one. A February release got things underway in the US and a significant re-boot is set to occur when Europe, or more specifically the UK, formally joins the fray in August. Subsequent release dates from the original may be just focal points as the ease of the digital world frequently enables music instantly shared across the globe. 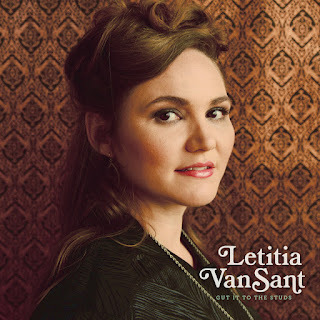 If the reception gets close to the two artists mentioned in the opening sentence then Letitia VanSant will be a valuable addition to a scene bursting with sincere song writing music sparked by the immortal embers of folk-Americana. GUT IT TO THE STUDS is the new album from this Baltimore-based artist, who has spent a considerable amount of time on honourable vocational excursions prior to deciding that the time is ripe to unleash a talent. This innate skill is to write, arrange and present a supreme concise selection of songs. Ones that range from the purposeful literal to spacious entities inviting the listener to deduce the end-point. Eleven tracks comprising of nine solo writes; one co-write and a smart cover keep you enthralled for forty-three minutes (or a timeless drift into an entranced zone if you discard the shackles of time). One absolute guarantee is that this record will improve with each play. If over familiarity is a reviewer’s crime, then guilty to the first degree. You can easily access Letitia’s thoughts behind the record online, but it is also has the invigorative presence to enable your own conclusion and meanings. Perhaps it is useful to understand the origin of album closer ‘Sundown Town’, which focusses on the racial divide far away from the suspecting world. The concluding line ‘we’ll watch others fight for freedom from the safety of our cells’ hammers home the feeling. As drenched the record is with country, folk and Americana sentiment, it retains a message of hope throughout. This is born from imposing some element of control in the themes as demonstrated in the opening two tracks and crowning it with the inspirational ‘Dandelion’ as the end approaches. The latter scorns life in the opening verse with ‘it’s like your only purpose is to buy what they sell/ Toss your every precious penny down a bone dry well’. Only to close with ‘I hope someday we will be free’. All framed with the imagery of a single weed piercing the concrete. While not taking anything away from the rest of the album, it is tough to dispute the opening two tracks soaring to the summit from the off. ‘Where I’m Bound’ obviously has autobiographical intent, but written in a way that it is free to be claimed. The title track sits in the #2 spot and nails the notion that sometimes we just have strip everything down and build it back up. The analogy of ‘Gut it to the Studs’ is prime time song writing. Both songs are delightfully sung and skilfully constructed with lasting choruses. These first four tracks mentioned are listed in the solo write column that marks out Letitia as a top class lyricist. This is further enhanced later in the record with ‘The Field’: a track served up as a softly delivered lullaby. In a similar vein is ‘Sweetbay Magnolia’, the album’s sole co-write with David McKindley-Ward, who also acts as the main guitarist on the album. The smart cover song selected is the Stephen Stills-written protest anthem ‘For What It’s Worth’, recorded by Buffalo Springfield in 1966 and mirroring the activist nature that surfaces when Letitia’s background is discovered. Back to the original content and ‘Come Sit By My Fire’ sells some hope in a midst of helplessness. The control element crops up again in ‘Taking Back the Reigns’ (not quite sure of the spelling intent here!) on a track where electric guitar moves the sound up a notch after fiddle plays a prominent role in the opening numbers. The remaining two tracks are ‘Bluebird’ where the tone takes a turn down the sadness route, albeit with a title reflecting the gorgeous vocals, which flourish throughout. ‘Wild Heart Roam’ sees a slight diversion, with gothic undertones applying to a track that has to peddle hard to keep up with those leading the charge. GUT IT TO THE STUDS is an absorbing album that sparkles with moving attributes from start to finish. It relays the best of country, folk and Americana in a delicately produced independent package far away from the soiled meddlers of a murky industry. Letitia VanSant has arrived on the scene in striking style to let her writing, music and vocals do the rest. In 2016 and 2017 Carter Sampson and Caroline Spence bloomed among a bouquet of established acts. In 2018 Brandi Carlile and Courtney Marie Andrews may have to make a little room for a new artist on the block.